Midway through building its first installments of electric-car chargers, Electrify America sketched out plans for its second $200-million round of investments in California on Wednesday. These installations will add more California cities, target charging networks for ride hailing services and buses, and develop Level 2 home charging for low-income neighborhoods and rural areas. Among the new California cities and regions that will get Electrify America chargers are the Riverside-San Bernardino corridor in eastern Los Angeles, and the Santa Cruz-Watsonville and Santa Rosa regions in Northern California. The company will also expand the charging networks it has already begun building this year in six other California regions: Los Angeles/Long Beach/Anaheim, San Francisco/Oakland/Hayward, San Jose/Sunnyvale/Santa Clara, Sacramento and environs, Fresno, and San Diego/Carlsbad. It will also open new highway routes such as to the Sierra Nevada mountains and to Lake Havasu. These will include 350-kw DC fast chargers that can replenish up to 20 miles of range per minute of charging. New programs will aid low-income communities in installing electric car chargers by offering no-money-down charger installations, where drivers can pay for a charger in monthly fees. READ THIS: Electrify America switches on the first 350 KW Fast Charging station in Chicopee, Mass. The company will also develop online portals that will help users sign up for the state's available rebates and incentives and encourage drivers to participate in utility demand response systems that allow utilities to incorporate electric-car charging and batteries into their load balancing efforts on the grid. New commercial chargers will be targeted at municipal and shuttle-bus fleets, at depots as well as along routes and at common layover points. Ride-hailing services such as Uber and Lyft will also have charging systems targeted for their drivers' use. In California's under-served rural regions of the San Joaquin, Imperial, and Coachella Valleys, chargers will be installed at schools and healthcare facilities. Two new charging installations will target electric self-driving-car fleets. For the first time, some of the new chargers will also have their own renewable energy sources such as solar panels with battery backups. 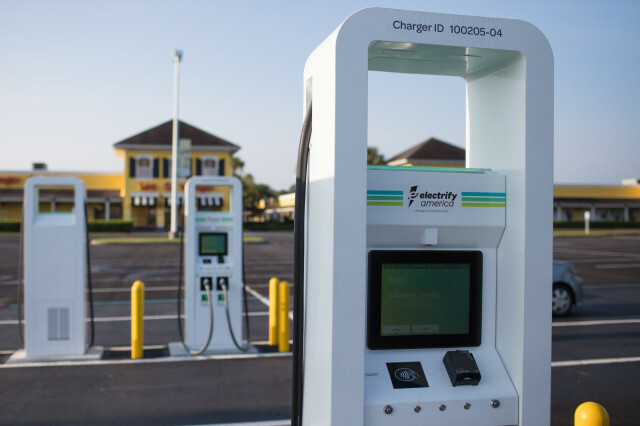 Electrify America began building its first charging stations last May and is scheduled to complete its first round of chargers by May 2019. Electrify America is a division of Volkswagen conceived to spend $2 billion nationally to build out electric-car charging infrastructure, as part of VW's settlement with California and the federal government. Of that total, 40 percent will be spent in California, roughly proportional to the state's share of the overall U.S. car market. The funds for the ten-year effort are divided into four financing rounds, this second round of which is scheduled to begin July 1, 2019. The latest announcement did not include details of second-round funding for the rest of the U.S.
By 2026, the Electrify America network is designed to rival Tesla's Superchargers, with fast chargers along major highway routes, as well as a combination of fast and slower chargers in and around cities and on commuting routes. Update: The photo accompanying this article was updated to reflect one of Electrify America's latest installations.